Johnson of Abilene High broke the state high school Class 5A record in the 800 meters when he won the event in 1:48.21 in 2001. He then anchored the mile relay to a gold medal, leading the Eagles to the Class 5A state team championship. At Texas Tech, Johnson won nine all-American honors, four consecutive Big 12 championships in the 800 meters and was NCAA runner-up in 2003 and NCAA champion in 2004. He also won the U.S. Olympic Trials in 2004 and reached the semi-finals of the 800 meters at the Olympics in Athens, Greece. 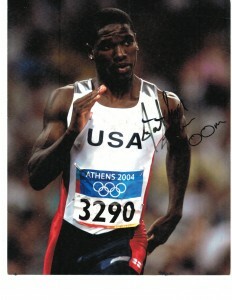 Johnson, who later ran track professionally, had the fastest time by an American of 1:44.7 in 2004.